Straits Times, 21 June 1980, p. 31. Die-hard Singapore football fans will proclaim the late 1970s and early 1980s as the best times for the national team. With the likes of “Gelek King” Dollah Kassim, the tough-tackling Samad Allapitchay, the Quah brothers and a then rising star in Fandi Ahmad, the team made it to seven consecutive Malaysia Cup finals and won twice. Their exhilarating performance on the pitch was captured in countless write-ups in the local newspapers, including a editorial cartoon in The Straits Times known as Sham’s Saturday Smile. This creation of graphic artist Shamsuddin Haji Akib offered avid football fans fans like himself a punchline on Singapore football, bringing smiles to fans looking forward to Malaysia Cup matches every weekend. After a commentary on how the national team’s performance was being disrupted by coach Trevor Hartley’s ever-changing line-ups, Shamsuddin depicted him as a mad scientist who would not stop experimenting. Responding to various reported incidents of unruly behaviour amongst fans and players, he turned in cartoons with referees wearing helmets and Hartley learning the Malay art of self-defence, bersilat, to control his players. Lee Kuan Yew (1971) by Alex Josey. In his editorial cartoons, Shamsuddin often condensed football-related events reported in the week into a single-panel caricature punctuated by a witty remark. This was a cartoon style the avid reader picked up from Time magazine, one of many skills he taught himself to become a graphic artist. Shamsuddin first entered the trade as a 16-year-old when he was an apprentice artist in The Straits Times. In 1954, he moved to Papineau Advertising where he would later hone his skills under art director Bill Mundy (aka William P. Mundy) and they would both win commissions to design murals for Paya Lebar Airport in 1963. After the local advertising agency closed in 1968, Shamsuddin moved to Donald Moore, helping the publisher and theatre producer design publicity materials and book covers—including the bold type-only “Lee Kuan Yew” cover for Alex Josey’s book on Singapore’s then Prime Minister. 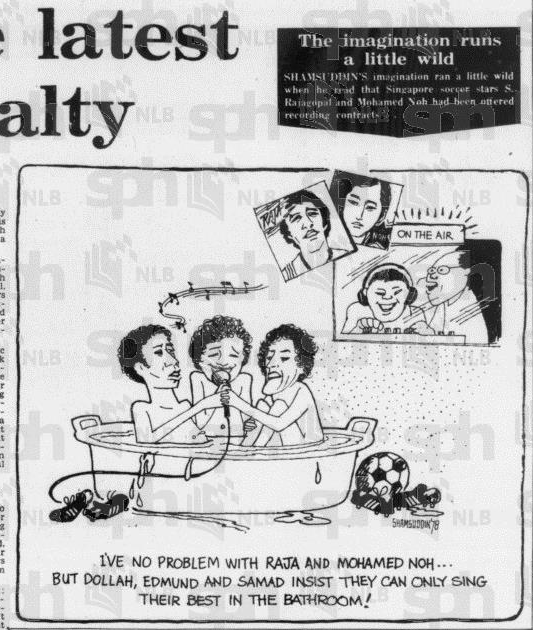 In the 1970s, Shamsuddin returned to advertising and accidentally kickstarted a career in cartooning after reading on The Straits Times about Singapore footballers S. Rajagopal and Mohamed Noh being offered a recording contract. Tickled by the news, he imagined how the other footballers—Dollah, Samad and Edmund Wee—fared in singing and sent in a cartoon to the newspaper. The sports editor (possibly Joe Dorai) published it and asked for more. Straits Times, 1 July 1978, p. 31. The marked the birth of “Sham’s Saturday Smile”, a name that Shamsuddin cheekily created by adding another S to the name for the Nazi’s paramilitary force Schutzstaffel (SS). Following his first cartoon in 1 July 1978, he sent in another one with this new title and depicting players at an empty National Stadium. No, there wasn’t a boycott by fans, but they had simply been unable to take leave! This piece reflected two stories published earlier in the week: one on national players not able to obtain leave for training and another of the Johor Malays team turning up to the National Stadium only to find their opponents had postponed the match. This straightforward yet risqué panel got his friend all worked up, particularly since the government was still campaigning against “yellow culture”, a Chinese reference to decadent behaviour and obscenity. “All my peng you (friends) said ‘You naughty ah you!’,” he recalls. “But I didn’t even have to draw anything!” Shamsuddin says he did not receive any official complaints over this cartoon, but adds that one had to be “careful” drawing political cartoons then. It was barely a decade since political cartoonist Morgan Chua and the Singapore Herald was closed down by the state in 1971. So whenever the editors rejected a submission with “Sorry Sham, no more space this week.”, he took it as his cartoon had crossed the line. Straits Times, 2 April 1979, p. 15. Straits Times, 2 February 1979, p. 17. Straits Times, 16 June 1979, p. 35. Shamsuddin’s dabbling in political cartoons also informed some of his later SSS works. Two weeks after Singapore launched its national courtesy campaign in 1979, which extended to announcements in the stadium requesting fans to be gracious, he turned in a cartoon of a wife lecturing a husband to not curse at the match or she’ll stop being courteous. 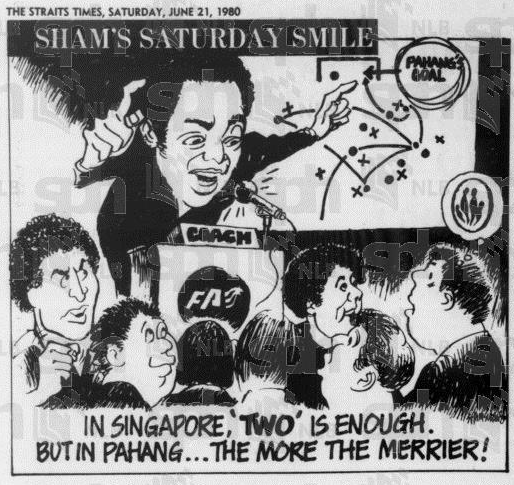 On the day Singapore took on Pahang in the 1980 Malaysia Cup semi-finals with a two-goal lead, Shamsuddin drew team manager Jita Singh reminding his players that ‘two is enough’ only for Singaporeans but not their opponents–a wink at the government’s population control campaign. (For the record, Singapore drew 1-1, advanced to the finals and became champions by beating Selangor). This is the last SSS I could find published. But according to Shamsuddin, SSS ended five months later when Singapore was expelled from the 1982 Malaysia Cup. The closure of SSS did not end Shamsuddin’s career as a freelance cartoonist. The paper continued publishing his cartoons, including, on its front page, a two-panel piece that poked fun at taxi fares going up on April Fools’ Day in 1985. Four years later, Shamsuddin briefly returned with a new cartoon series when he was commissioned to illustrate “Robie the Robot”, a mascot to promote an automation culture as part of the national productivity drive. Straits Times, 31 March 1985, p. 1. Thank you Dahlia Shamsuddin, the daughter of Shamsuddin, for giving me the opportunity to interview her father. See an album of Sham’s Saturday Smile here.